Gary Tison secured a place in history for his family. Unfortunately, it was with the landmark death penalty case, Tison vs. Arizona. He exerted a dysfunctional Svengali-like control over his sons that made everyone suffer, particularly their victims. With their assistance, Tison escaped from prison, igniting a spectacularly ill-fated flight from justice. 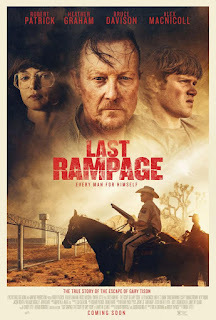 If ever there was a compelling argument for the death penalty, it would be Tison, who chillingly comes to life in Dwight Little’s true crime drama, Last Rampage (trailer here), which opens this Friday in Los Angeles. While doing well-deserved time, Tison was a model prisoner, so he was duly moved to a lower security annex. In retrospect, that was a huge mistake. His three sons just sauntered in on visiting day, just like they always did, except this time they had a picnic basket full of guns. At least Tison was a loving father, albeit in a seriously warped way. His cellmate and fellow escapee Randy Greenwalt was a stone-cold sociopath. Donnie Tison, the only Tison brother exhibiting any capacity to think for himself clashes early and often with Greenwalt. Their father will also try to shift the blame for the worst of the post-escape crimes on his former cellmate, but it is hard for the Tison boys to ignore what they see with their own eyes, especially for Donnie. Of course, it is not just their father who poisoned his sons’ heads. Their mother Dorothy is sort of like a Lady Macbeth-instigator, who keeps herself in a willful state of denial regarding her husband’s dangerously erratic nature. Sheriff Cooper already lost friends and colleagues to Tison, so he will have Tison’s wife and semi-estranged brother closely watched. Rampage is a somewhat frustrating film, because it assembles some truly terrific performances in a cookie-cutter TV-movie-of-the-week package. Frankly, Robert Patrick’s charismatic ferocity as Pops Tison will be an out-and-out revelation for those who only know him as the T-1000 in Terminator 2 and subsequent self-parodying appearances. In a more distinctive film, his performance could have been a dark horse awards contender. Likewise, Heather Graham is unusually intense playing against type as Ma Tison. It is a neatly calibrated performance that leaves viewers unsure to what extent she has been deluding herself about her beloved husband. As always, Bruce Davison is rock-solid as Sheriff Cooper, providing a grounded, moral center to the film. John Heard only appears briefly, but he makes the most of it as the “colorful,” ethically questionable Warden Blackwell. Chris Browning is also all kinds of creepy as Greenwalt, but in a quieter, clammier, low-key kind of way, which nicely compliments Patrick’s flamboyant bluster. Sadly, the Tison brothers are rather dull compared to everyone else. You have probably seen some of Little’s earlier films, like Halloween 4 or Marked for Death, back when going to the latest Steven Seagal film in theaters was a serious option instead of a depressing joke. Most of his recent work has been in episodic television (Bones, Prison Break, Nikita), so maybe it was inevitable Rampage would have a TV vibe. Nevertheless, Little brings out the best in his cast and the film’s late 1970s period details are spot-on. It is certainly far more polished and professional looking than Do It or Die, another recent true crime indie film helmed by a TV veteran (a comparison only a handful of us truly intrepid film dissectors would ever think to make). Patrick and Graham really do some first-rate work in Rampage, so it is a shame it will probably not be screened and covered more widely. As big-screen storytelling, it is serviceable at best, but the turns from the two well-known co-leads could change viewer and industry preconceptions of them. Recommended as a future Netflix or Shudder stream, Last Rampage opens this Friday (9/22) at the Laemmle Music Hall.